This article is about the pilot and National Transportation Safety Board member. For others, see Robert Sumwalt (disambiguation). Robert Llewellyn Sumwalt III (born June 30, 1956) is an American academic, aviator, government official and writer. He has been a board member of the National Transportation Safety Board since 2006, serving as the agency's chairman since 2017. He was sworn in as the 37th member of the National Transportation Safety Board in August 2006, whereupon President George W. Bush designated him as vice chairman of the board for a two-year term. In November 2011, President Barack Obama reappointed Sumwalt to an additional five-year term. 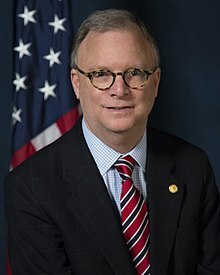 In March 2017, President Donald Trump reappointed Sumwalt to a five-year term expiring on December 16, 2021 and designated him as Vice Chairman for a term of two years. In August 2017, the U.S. Senate confirmed Sumwalt as the NTSB's next chairman. He succeeded Christopher A. Hart in this role. Since joining the board, he has been an advocate for improving safety in all modes of transportation, including teen-driver safety, impaired driving, distractions in transportation, and several rail-safety initiatives. He holds a Bachelor of Science degree from the University of South Carolina and a Master of Aeronautical Science (with Distinction) from Embry–Riddle Aeronautical University, specializing in Aviation/Aerospace Safety Systems and Human Factors Aviation Systems. Prior to coming to the board, Sumwalt was a pilot for 32 years, including 24 years as an airline pilot with Piedmont Airlines and US Airways. After his airline career, he joined SCANA, a Fortune 500 energy company, where he managed its corporate aviation department. He logged over 14,000 flight hours and earned type ratings in five aircraft. Sumwalt worked on special assignment to the US Airways Flight Safety Department where he was involved in the development of numerous airline-safety programs. He served on the US Airways Flight Operational Quality Assurance (FOQA) Monitoring Team. Sumwalt served as an air safety representative for Air Line Pilots Association (ALPA) for 17 years where he chaired ALPA's Human Factors and Training Group. He was a co-founder of that organization's Critical Incident Response Program, which provides guidance to airline personnel involved in traumatic events such as accidents. From 1991 to 1999, Sumwalt conducted aviation-safety research as a consultant to NASA's Aviation Safety Reporting System, where he studied flight-crew human factors. Sumwalt co-authored a book on aircraft accidents and he wrote chapters pertaining to aircraft accident investigation in two books. He has written extensively on aviation-safety matters, having published over 90 articles and papers. 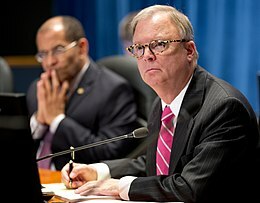 In 2003, Sumwalt joined the faculty of the University of Southern California's Aviation Safety and Security Program, where he was the primary human-factors instructor. In recognition of his contributions to the aviation industry, Sumwalt received the Flight Safety Foundation's Laura Taber Barbour Award in 2003 and ALPA's Air Safety Award in 2005. He is a 2009 inductee into the South Carolina Aviation Hall of Fame. In recognition of his accomplishments, Sumwalt was awarded an honorary Doctor in Science degree from the University of South Carolina and an Honorary Degree from Embry-Riddle Aeronautical University. Walters, James M Walters; Sumwalt, Robert L. (2000). Aircraft Accident Analysis – Final Reports. New York City, New York: McGraw-Hill. ISBN 978-0-071-3-51492. ^ a b Mulero, Eugene (August 7, 2017). "Senate Confirms Sumwalt for NTSB Chairmanship". Transport Topics. Retrieved 8 August 2017. ^ a b Mark, Rob (September 29, 2016). "NTSB's Sumwalt Receives Bombardier Safety Standdown Award". Flying Magazine. Retrieved 18 May 2017. ^ "Presidential Nominations Sent to the Senate October 12, 2011". The American Presidency Project. Retrieved 18 May 2017. ^ "President Donald J. Trump Announces Intent to Nominate Personnel to Key Administration Posts". The White House. March 23, 2017. Retrieved 18 May 2017. ^ "Hon. Robert L. Sumwalt, III". Smithsonian National Air and Space Museum. Retrieved 18 May 2017. ^ Reed, Jon (August 16, 2013). "Robert Sumwalt, NTSB member on scene of UPS cargo plane crash, is aviation safety expert, former airline pilot". AL.com. Retrieved 18 May 2017. ^ McInerney, Salley (May 27, 2015). "Columbia man investigates some of biggest air, train disasters in job with NTSB". The State. Retrieved 18 May 2017. ^ Sumwalt, Robert (September 14, 2016). "The Untold Story behind the National Transportation Safety Board". JDA Journal. Retrieved 18 May 2017. This page was last edited on 22 February 2019, at 04:26 (UTC).